Charles Egeler Reception and Guidance Center is located in Jackson Michigan. It is a reception and guidance center that is responsible for the intake and processing of all adult male offenders within the Michigan Department of Corrections. 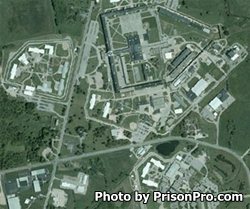 During classification inmates have an extensive series of medical, psychological, educational, and security tests performed to determine which correctional facility will best suit their needs. Processing through intake takes approximately twelve days, and the average duration of an inmates stay at the Charles Egeler Reception and Guidance Center is anywhere from 30 to 45 days. Charles Egeler Reception and Guidance Center consists of three individual units. The main complex houses inmates who are being processed. Duane L. Waters Health Center Unit is responsible for the medical treatment of both female and male prisoners. The C-Unit houses minimum security inmates who have medical needs. The entire Charles Egeler Reception facility has a maximum capacity of 1,382 inmates. Because this is a reception and intake center inmates located here who are undergoing classification and diagnosis are not allowed visits from friends and family. Offenders at Charles Egeler Reception and Guidance Center are allowed attorney and clergy visits only. The visiting hours for this facility have recently changed. Please visit the Michigan Department of Corrections website here for the latest visiting hours.